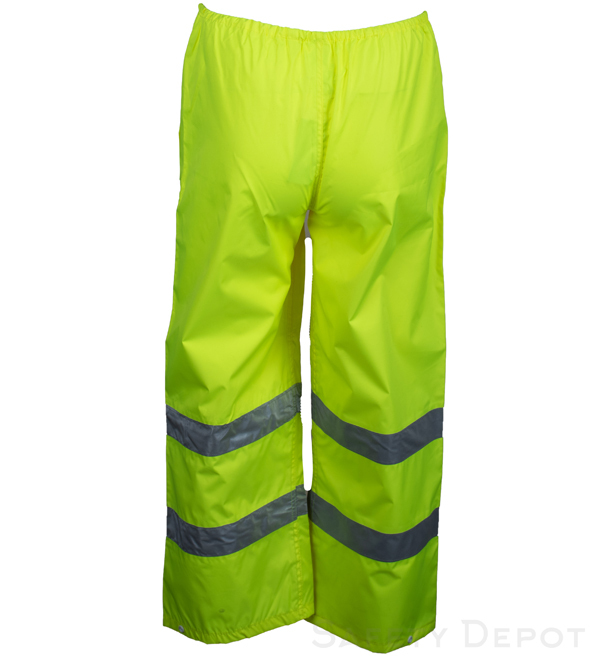 Comfortable and loose fitting made with lightweight polyester PU (polyurethane) coated material, slip these rain pants over your regular work pants to protect you and your clothing from rainy, windy conditions. These rain pants come with an easy elastic waistband in sizes small through 5XL to fit a variety of body types, and side slit pockets to carry keys and more. Adjustable Velcro bottoms help to keep pants snug over your work boots. From Emery of Danbury, Connecticut on 11/20/2017 . Very good for safety for night time dog walking. I also got the jacket, but in warmer weather it's easier and cooler to wear these. From Annette Sharp of Baton Rouge, Louisiana on 2/22/2016 . We have ordered these products before and staff are very happy with the product. Unfortunately, this order was shipped to my address in Baton Rouge, LA instead of the labeled address for our Shreveport, LA office. So we incurred additional shipping charges to have it correctly delivered to that regional office. From Annette Sharp of Baton Rouge, Louisiana on 2/17/2016 . Our field staff are very satisfied with this product.